Wood, Aluminum, Gold Leaf, Paint and Brass. Including 8 Edison Style Globe Lights, dimmer switch and braided cloth cord. Signed (initialed) by artist, lower center. 35” Wide (Round) x 5” Deep. Cord approx. 5’ in length. Inspired by early American and European folk art and advertising, particularly dusty old signs languishing in Parisian and Hungarian Flea Markets the artist observed on her travels, each sign is hand-constructed using family building techniques passed down generations. Each sign is one-of-a-kind, hand painted, gold leafed, and hand-antiqued by the artist, creating a uniquely illuminated work of art. Wood, Aluminum, Gold Leaf, Paint and Brass. Including 8 Edison-Style globe light bulbs, dimmer switch and braided cloth cord. Signed (initialed) by artist, lower center. 35” Wide (Round) x 5” Deep. Cord approx. 5’ in length. 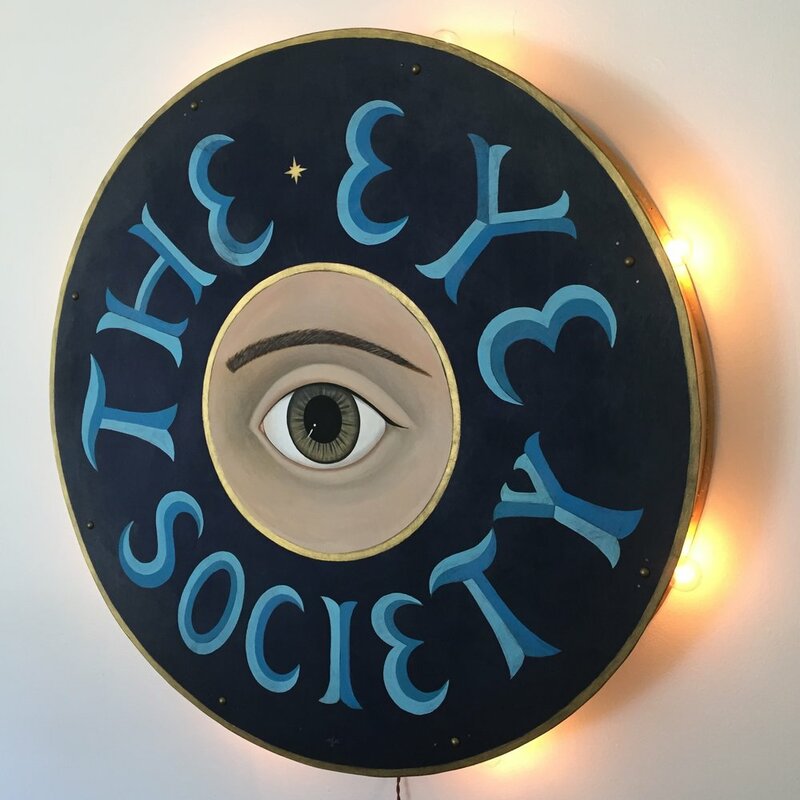 Inspired by early American and European folk art advertising, particularly dusty old signs languishing in Parisian and Hungarian flea markets the artist observed on her travels, each sign is hand-constructed using family building techniques passed down generations. Each sign is one-of-a-kind, hand painted, gold leafed, and hand-antiqued by the artist, creating a uniquely illuminated work of art.